There was a good turnout for the JVAC match on both Four Islands and the Horseshoe pools on the Decoy Lakes complex. My preference for the Horseshoe Pool would have been all wrong on the day as it was not at its best. Clive Cole led the way there with 59lb 5oz from peg three, a net of carp taken on the pole with red maggot. Runner-up on unfancied 19 was Nick Carlton with 29lb 7oz followed by Chris Baldwin who put 28lb 2oz to the scales from peg 2. On Four Islands there were several better weights, topped by Gus Gausden on peg three. He fished sweetcorn close in to put 55lb 5oz to the scales. 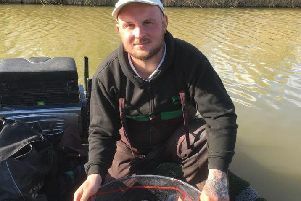 Mike Mitchell came second from peg seven taking carp to 5lb on the pole with red maggot to weigh in 53lb 12oz. Then came Dan Abbott, in third place. He fished the pole again on maggot long down the edge to put 45lb 12oz to the scales. Tydd Gote AC, Wednesday: 1 Len Chucksmith 9lb 12oz. Tydd Gote AC, Sunday: 1 Darren Williams 12lb 12oz; 2 Barry Stacey 8lb 12oz; 3 Andy Lawrence 7lb 7oz.